Seven years ago I got plantar fasciitis which refused to go away. I tried everything. Nothing helped. Then I heard about a new rad running shoe Hoka One One. Apparently a couple of guys had left Salomon in France and developed this new brand for mountain ultra running. In spring 2011 I unboxed a pair of Bondi B. They felt big and weird. People pointed at these 'clown shoes' and laughed at me. I began running longer and longer daily in Hokas. One day my pf was gone. Time to fly, as the slogan goes. I've run a lot of alpine ultra trail races in various Hoka models since. Not all of them were faultless. For example, the 2014 Stinson Evo was an ankle-twister. But I'm not complaining as I managed to finish Lavaredo Ultra Trail, Eiger Ultra Trail and Ultra Trail du Mont Blanc with them that summer. What I love in Hokas is the 'meta-rocket' design that tips at the ends, the 'bucket seat' for your foot inside the midsole and the half-cm heel/toe drop. They are also relatively lightweight for their size. At the end of the day it's not about the Hokas. But without them, there probably wouldn't be any of it for me. So thank you Hoka One One and let's keep on rocking together! I wouldn't be running today if it weren't for hokas! Hope you training is going well! Thanks Will! Over 100 miles running this week - good times! You got to get on Strava man! 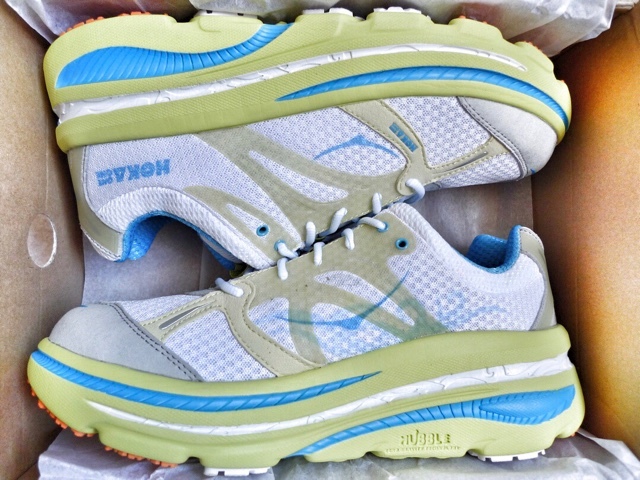 Please define which model of Hoka thats in this photo? This photo is from spring 2011. Bondi B has changed quite a bit since then!